This weekend, as our community begins the Days of Awe, we also mark the remembrance of the greatest loss of life ever to take place on Maryland soil…the battle of Antietam. For those of us whose ancestors were in Vilna or Warsaw in 1862, it is often hard to feel a personal connection to the events of those days. But a recent visit to the JMM collection made it all feel very real to me. 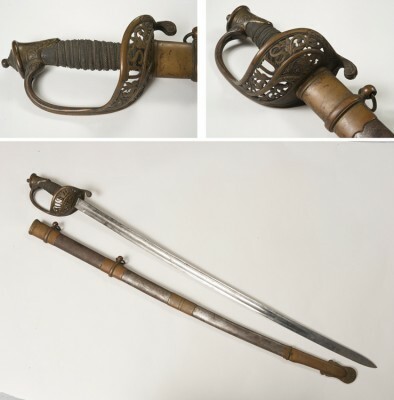 In preparation for our President’s Circle tea in August, I was introduced to a few of the most memorable items we hold, one of which is a sword from the Civil War. It seems the sword was the property of Gen. Leopold Blumenberg. Gen. Blumenberg was a Baltimorean and his first ambition had been to be a soldier…in the Prussian army. By age 21 he had been promoted to first lieutenant for his distinguished service in a Prussian campaign against Denmark. But in the years that followed he became convinced that anti-Semitism would always constrain his future and he cast his lot as an American immigrant. Arriving in 1854 he joined Har Sinai Congregation and came under the influence of their abolitionist rabbi , David Einhorn. After the attack on Fort Sumter, he took up the cause of forming a regiment of fellow Unionists in Baltimore – the 5th Maryland Infantry. It is said that this action so raised the ire of local Secessionists that Blumenberg, now appointed as a major to the lead the regiment, needed a full-time bodyguard to protect against threats of assassination. 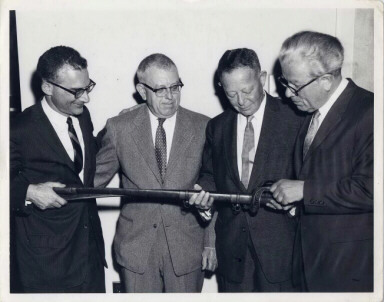 Presentation of Leopold Blumenberg's swords to the Jewish Historical Society of Maryland, May 1, 1962. Pictured are (left to right): Edwin Wolf II of Philadelphia, Dr. Harry Bard-Vice President of Jewish Historical Society of Maryland, Hugo Dalsheimer-President of Jewish Historical Society of Maryland, Dr. Isaac M. Fein-Curator of Jewish Historical Society of Maryland. The 5th Maryland spent most of the first year of the war in training at Fortress Monroe in Virginia. The first (and last) real action for Major Blumenberg was his assignment to join General Pope’s command in the defense of his home state. General Lee had crossed the Potomac expecting to benefit from an uprising of the many Confederate sympathizers in Maryland. His campaign got only as far as Sharpsburg when on this very day 150 years ago he encountered Pope’s troops. Blumenberg and the 5th Maryland were in the thick of the fighting, in a spot later to be known as “Bloody Lane”. A sharpshooter managed to hit Blumenberg in the thigh. He was removed from the battlefield, surviving the wound, but never fully recovering. Blumenberg returned to Baltimore from the remainder of the war, serving first as Provost Marshal and later as Superintendent of the Warehouses. In this last position he was made brigadier general, by brevet. A few years later he finally succumbed to his injury. 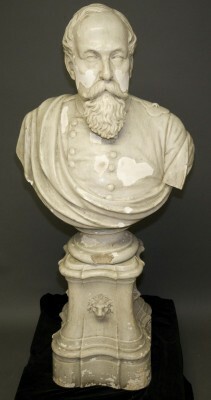 Painted plaster bust of General Leopold Blumenberg, 1963.40.1. In September 1862, the high holidays came late, but the sacrifices came early. Perhaps in this sesquicentennial year, our Yizkor memories should include a place among the martyrs for Blumenberg and the other Jews of the Civil War who gave their lives in the cause of freedom.